Book Three in the Adventures of Homer the dulcimer is taking shape. It will not be long before you can meet some of Homer's other musical relatives. Homer's mother and father are planning a family reunion for Homer's grandfather. There are lots of musical family and some from different countries in Europe. Homer is excited to learn about some of his European cousins and be able to sit down and play with them. 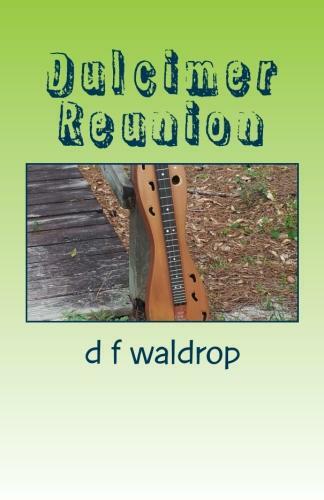 Dulcimer Reunion is hoping to becomer available to you in late Summer! While waiting for this adventure make sure you get your copy of book two - Dulcimer Campfire and enjoy Homer's latest adventure while waiting to see what happens when Homer's family gets together for a family reunion. This is a work in progress and this is a working cover for the book. I have several ideas planned for the cover but wanted everyone to have a chance to look at what I am working on for Homer the dulcimer. Red Rooster was prancing around the barnyard with his chest puffed out eyeing all of the hens making sure they were not getting into any trouble. He could hear Homer on the back porch playing his song. All of a sudden he could hear bang – bang – bang and clank – clank – clank from some old roadster pulling into the driveway. Not sure what all the commotion was about red rooster scurried to see what was going on. Henry’s sister Clara had come for a visit. As she tried to get out of the car, one package went one way and another flew in Red Rooster’s direction and just missed him. “Oh dear me” Clara said. “I am just a thither today.” Can I help?” Homer said as he jumped off the porch to try and catch one of the packages. “Oh Homer!” Clara exclaimed. “You get older every time I see you! Since this is a Family Reunion what is one of the big things you do at a family reunion? You announce to everyone that your family is together. How do you do that? - With Tee-shirts! I am working on the possibility of offering Dulcimore Family Reunion tee-shirts to all of Homer's fans. All of this is a work in progress so you will have to wait and see if you will be able to take home your own family reunion tee-shirt in honor of Homer's family - The Dulcimores!